Mangel-wurzels are excellent farm-raised pig and chicken food. Despite some irrigation from our rain-capture IBC’s, the dry summer prevented us from getting a bumper crop; nevertheless, we expect to root cellar at least 1,000 lbs. of these fodder beets to feed the animals this winter. Moving chickens over a buckwheat paddock. The birds knock the green manure over, crimp it, eat the buckwheat seeds, and add a layer of manure to be absorbed by the carbon; then after the first rain, the buckwheat seeds the chickens missed sprout to add a second crop of buckwheat. After a second pass, and a third germination, frost kills the buckwheat before it can set seed, so it never becomes a problem in the spring garden. 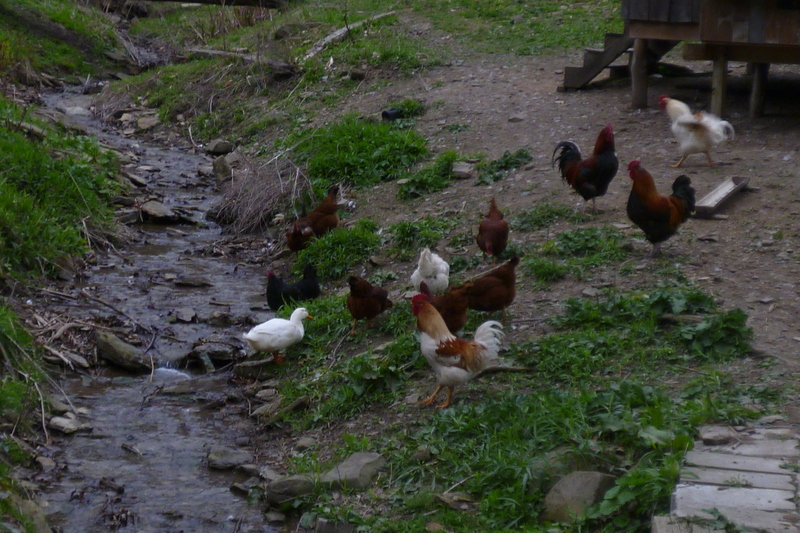 Every farmer or homesteader knows the importance of water for even the smallest garden patch or pair of chickens or rabbits, so making sure our water supply is clean and reliable is one of our first priorities. Still, where livestock and garden irrigation water can be supplied from existing wells or municipal sources by the mere twist of a faucet handle, why would we look any further? To begin with, water that is pumped from the aquifer is essentially non-renewable, while municipal water sources are often treated with chemicals we’d prefer to avoid. And, in the event of an interruption of grid service, or the contamination of our city water supply – something we can no longer consider just a remote contingency, with reports of chemical spills and government corruption on a large scale becoming more frequent – the clean water we rely on to flow from our pressurized pipes just may not be there. And beyond these concerns is another, with more wide-reaching implications: sustainability. Every local water source traces back, in the end, to rainfall. But pavement, rooftops and bare soil account for more of our planet’s surface every year, so that precipitation, instead of soaking into the ground, runs off, carrying topsoil with it and flooding areas downstream. When we hold precipitation on our land and give it time to percolate into the soil, we recharge the aquifer, bank water in our soil, and increase the resilience of our chosen place. Simple homestead technologies and tools are all we need to begin holding our land’s allotment of water and carrying it to points of need in the garden, barn and pasture, and it just so happens that, doing so, we also save money and insure our farm enterprises against technological failures. Knowing where our water is, how to detain it for use, and how to get it where we want it to go, raises us to a new level of independence. 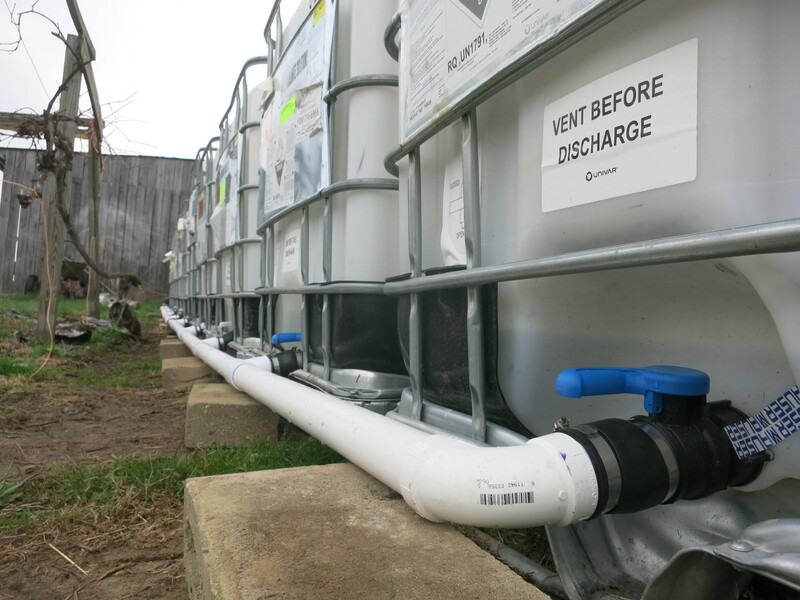 How to begin holding rainwater on the farm? Well, there’s roof water, of course. A little ambition and a few hours will turn any farm building into a rainwater catchment. As little as an inch of rainfall on a twenty by twenty foot roof delivers almost 250 gallons, enough water for quite a bit of gardening or livestock. Those little fifty-five gallon rain barrels that fit under your downspout are nice, but they don’t begin to take advantage of this resource. Buying large plastic water storage tanks, either rigid or collapsible, which will hold hundreds of gallons is costly, but keep in mind that anything large and stable which will hold water may be a possibility. Large plastic shipping cubes with aluminum frames (sometimes called ‘IBC’s’, or ‘intermediate bulk containers’), each capable of holding about 300 gallons can often be bought for less than fifty dollars. But even these can store only a fraction of what the average house roof sheds in a half-inch rainfall, so on our farm multiple IBC’s have been made to fill and empty simultaneously by plumbing them together at their ground-level spigots. With rubber couplings and ‘T’ fittings mating these sometimes odd-size openings to a length of PVC, water flowing into any single tank fills all of the tanks at once. (photo #1) A spigot on one end of the PVC connector then lets us draw from all the tanks simultaneously; no switching the hose around to drain each tank individually. Four IBC’s plumbed together provide almost twelve hundred gallons storage capacity, enough water for a lot of livestock, or to see even a large garden through a significant dry period. And since the more seasonal our rainfall, the larger our storage tanks need to be, these multiple IBC arrays have a further advantage: they let us add more capacity incrementally, increasing as the needs of the farm evolve. Side bar: Intermediate bulk containers are available everywhere. Food processing facilities, confinement farm operations, beverage bottling plants, water treatment plants and all kinds of factories that buy liquids in bulk are sources you can investigate for IBC’s. While plastic for livestock and irrigation water does not have to be food grade, knowing what a container has held lets you avoid possible contamination to the water you are planning to store. Try to find IBC’s that originally held food, or food-related products like food-grade iodine, or food-safe glues and inks (like those used for processed food packaging). If you can find a source for storage cubes that have already been cleaned, it may be worth your while to pay for the service; but even if you have to scrub your new reservoir yourself it will be worth the trouble. We clean new IBC’s with dish soap and a garden hose and spray nozzle, possibly helped out with a long-handled broom; then rinse until the water no longer makes suds. For the homesteader at all interested in serious water storage, a good motto is “bigger is better”. Above ground swimming pools hold large volumes of water and may be had second hand for pennies on the dollar. 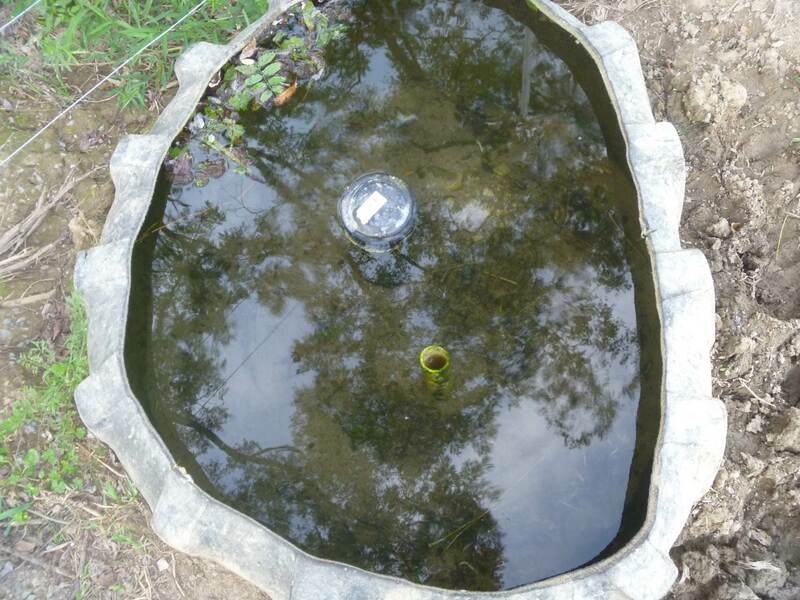 We’ve also seen people successfully repurpose plastic septic tanks for this use. Get creative; in our neighborhood, one farmer has even made temporary use of a round bale ring lined with a waterproof tarp. And where all the roofs on the homestead are filling rain barrels, free, ambient-temperature water (the best for garden use) is available everywhere on the farm. Roof downspouts may be the most obvious way for us to capture rainfall, but with a little thought other systems can be devised. Where sloping ground allows, catchments may be located below the outlet for a French drain system. In this case, care must be taken to ensure that water is collected without ever impeding outflow, an important factor where a blocked pipe could mean water backing up into the drain system or basement. On our farm we have buried a bucket in the ground below one French drain outlet, plumbing a hose from this to a multiple-IBC catchment, so that water exiting the French drain pours into the bucket and flows through the hose to the catchment, while any excess water simply runs over. But what about on level ground? 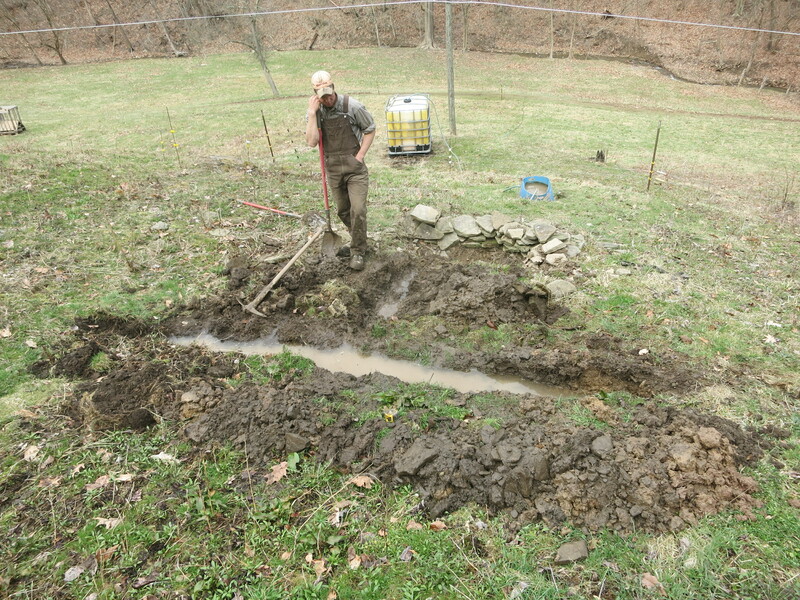 Living in Appalachia, we have plenty of slope below our buildings, but for the farm on level terrain it may be necessary to use an in-ground cistern. This, while involving a larger initial expense, has the advantage of keeping water cool in summer, frost-free in winter. And the more water we can sequester for use on the farm, the better: where the soil and slope allow, bringing in heavy equipment and building a pond not only enlarges water storage capacity, but increases ecological diversity and edge spaces. The bucket-plumbed-with-a-hose (photo #2) that catches water in our French drain system is easy to assemble — a trip to the hardware store will get you a ‘cooler drain’ fitting for about four dollars, letting you hook up a standard garden hose to any plastic bucket or barrel. This hybrid container can be a handy tool in other places, as well. Creeks are valuable water sources, but may be difficult to utilize, since unmanaged livestock with access to a waterway tear down banks and create erosion problems, not to mention pollution issues downstream; and damming a stream safely and effectively can be expensive and labor-intensive. So one way we take advantage of our creek water is by placing a couple of these bucket-and-hose arrangements under a culvert or waterfall in the bed of our pasture stream. The creek keeps the bucket constantly full while the hose lets us direct a volume of water out of the bed and over the bank to points lower down, where it may be used to fill a storage container or simply provide constantly running water to a livestock tank. A screen or perforated cover over the water intake keeps leaves, small critters and the like from blocking the hose, while ballasting the bucket with large stones holds it in place even when the creek is in spate. An existing pond is an asset to any piece of property, but animals with unlimited access to pond banks quickly become a problem. Livestock trails on the downhill side compromise the strength of pond banks, and trailing from uphill carries silt and manure which can contaminate stock water or decrease the depth of the pond. 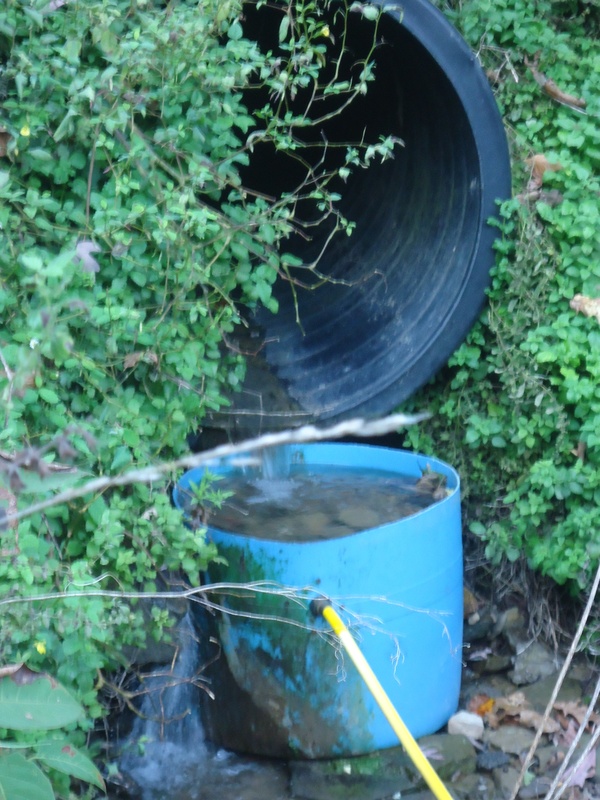 Very short term access to only a small area of the bank at a time, or “flash grazing”, prevents such damage and can even have an ecologically positive impact, but one way to make full-time use of this valuable surface water with passive technology is the simple siphon. A float anchored in the middle of the pond can suspend a garden hose out where water plants and mud won’t get in to clog it up; once the hose is full of water (try immersing the entire hose gradually, then closing the male end with a closed spray nozzle) you carry the male end over the bank and downhill, where you can hook it up to a stock tank with a regulator valve. The weight of water in the hose pulls water down to fill the tank; the stock tank valve stops the flow when the tank is full; and as long as the end of the hose in the pond stays under water, no air enters the system to interfere with flow. One excellent source of water that is often overlooked is the water already present in our soil. While most of us don’t have an artesian well bringing water to the surface for us, many folks know of one or more places on their land where groundwater pools on or near the soil surface in a slow-running spring or ‘seep’. This is the spot where the ground stays soft all summer, even in a dry spell; animals leave deep foot marks that fill with water, and there may be water-loving plants like cattails, sedges or horsetails. Here rainwater from higher up, percolating through the soil and meeting an impervious layer of rock or clay, runs horizontally until it reaches the surface and makes this perennially wet spot. With a little effort and some ‘tile’, or perforated pipe, we can catch much of this water and collect it in a tank or cistern. A simple French drain-type system can easily be dug by hand; we have two such systems on our home farm that provide us with thousands of gallons of water a week, year round. Even a very little flow of water – a flow with a smaller diameter than that of a standard pencil – can provide hundreds of gallons of water a day. And because this water comes from below the soil surface it is cool in summer and relatively warm in winter, protecting it against freezing — a huge advantage for winter livestock use. The next step after capturing the water our land and climate make available to us, is getting it where we need it to be, and for this, gravity is our best friend. Ideally, water capture and storage should happen as high on the land as possible, allowing us to divert water merely by running a hose to the point of need. Even a low knoll adds verticality, but failing this we can dry set cement blocks or railroad ties to form an elevated base for a water tank. Here again, we see an advantage in larger catchments, since the more water we have contained, the higher the water pressure will be, even where the drop in elevation is less considerable. Where gravity is not in our favor, there are a number of non-electric devices that can help us raise water to a stock tank or reservoir. Sling pumps, also known as propeller pumps, use the speed of flow in a stream to pump a volume of water over the stream bank; sling pumps are limited in that they require a sizable stream for adequate flow, but small ones are available that can raise water up to 30 ft. with as little as a 1.5 ft./second flow. For even a small volume of water on a slope, ram pumps and high lifter pumps also use hydro-power, and these devices can raise water to a significant elevation, the actual vertical lift varying with the volume of water flowing and the lateral distance we want the water to go. A fourth option, the stationary nose pump, on the other hand, actually uses animal power: thirsty livestock quickly learn to operate a piston by pushing on it with their noses, raising water from a nearby stream or pond a few feet and filling a small reservoir. Keeping a reliable supply of water in front of livestock is essential, when only a few dry hours on a hot day can mean stress, even death. Static water systems like rain catchments, since their refill is only periodic, must be managed differently, but can be made to serve our farm needs just as well as constant-flow systems, and without the need to return overflow to a waterway. Stock tank refill governed by float valves lets you be confident that your animals will always have a full tank in front of them, and it’s way less work than hauling buckets. Not all livestock tank valves work well under very low pressure, but there are several available that have been specially designed to function in a simple gravity-feed system. Float valves in a variety of designs, operating on the same principle as the tank valve in a standard toilet, are available at the farm store, starting at just twenty dollars or so. On our farm we use Jobe floats and Hudson valves with good results; these extremely simple valves allow even fairly large particulates to flow through the system without creating an obstruction. With a little creativity, livestock water systems can be cobbled together out of cheap or salvaged materials. Most of our small, portable livestock tanks are just the half of a plastic 55-gallon barrel plumbed with a low-pressure valve, their light weight making them easy to empty when we make our daily paddock changes (photo #3). No expensive or stationary water pipe is necessary; almost all our water is delivered through ordinary garden hose, keeping our system as flexible as possible. Not only is such hose easy to find and cheap to buy, but often it can be acquired free if we are willing to do some scrounging, and maybe invest a couple of dollars in a splice or new hose end. Water quality is always important, and not all captured water is clean water. Whether we’re harvesting water from a roof, roadway or watershed, it’s important to do a little research into where our water has been before it reaches us. Surface water may carry agricultural chemicals like pesticides, herbicides and fertilizers, things we don’t want in our irrigation and livestock water. Petrochemicals from roadways may enter the watershed in a heavy rainfall; being aware of this possibility gives us a chance to divert first flow away from our catchments. And are your neighbors being responsible about septic systems and automotive and household chemicals? It may be difficult or impossible to find out directly. Fortunately we have means closer to hand for determining the quality of our surface water: aquatic life can be a good indicator of the presence or absence of contaminants. Check your local NRCS/SWCD website for a list of local wildlife species whose presence indicates clean water. If you need more information, find a lab that performs a water test rated specifically for agricultural purposes and send them a sample. Closer to home, lead or galvanized roofing will leach small amounts of metal into rain water, more in areas prone to acid rain, and chemically treated cedar shakes or siding can leach arsenic, affecting both roof water and French drain runoff. Foundation plantings that have been sprayed with garden chemicals, or mulched with chemically treated woodchips, can also compromise the quality of French drain-captured water. Environmental hazards sometimes seem to be lurking behind every bush, but don’t throw out the baby with the bath water; caution about possible impurities in captured water should be weighed against the many and real advantages to catching and holding water on the farm. Keeping water fresh and clean once we’ve sequestered it also requires a little thought. Algae can clog water systems as well as making the water itself distasteful to livestock, but by putting above ground cisterns on the north side of a building or slope we can keep water cool, one of the first and easiest ways of preventing algae buildup. A bale of barley straw in a pond is supposed to discourage algae growth; for a smaller reservoir, a mesh bag of barley straw should have the same effect. We use goldfish to manage the algae in our IBC-fed systems. Each spring we buy twenty or so feeder goldfish for a couple of dollars; by late fall we’ll be down to half that number, but the survivors are big enough to be moved into the pond for the winter, where they can take their chance with hungry ducks, snakes and herons. And water in the winter time can be the biggest challenge of all. In fact, one of the reasons farmers and homesteaders cull their flocks and herds in the fall is to minimize or eliminate the need for water on the farm during the cold months. 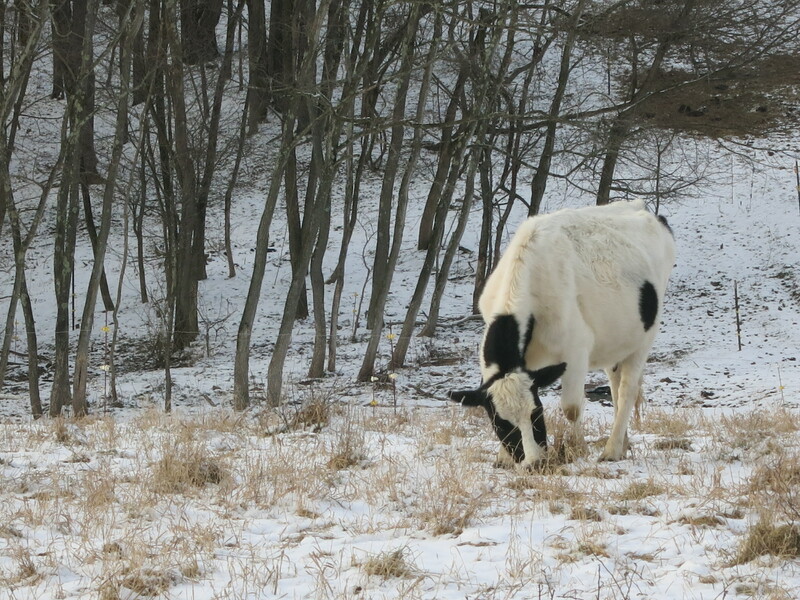 Keeping stock tanks open requires some thought and planning, but for those of us who want to overwinter livestock, there are ways to do it that don’t create stress or run up the electricity bill. The farmer can take further advantage of sub-surface warmth with a stationary stock tank made by sinking a six-foot length of culvert four feet in the ground and flooring it with concrete; cold water sinks to the bottom where it is re-warmed, keeping the water circulating and maintaining above-freezing temperatures. And if a deep in-ground tank of this kind seems to be a safety concern for children or small animals, a similar effect can be had by sinking a section of culvert to the level of the ground surface and then placing a stock tank over the opening. The air trapped in the culvert stays well above freezing, buffering temperatures in the tank above. People of good will may differ about the details, but with erosion, pollution and falling water tables causing human problems wherever we choose to look, we shouldn’t have to come to a quorum on the causes before we undertake to do whatever small part is within our reach to halt the decline. Agriculture comes in for its share of the blame whenever conversation turns to environmental degradation, and unfortunately there’s every evidence that our farming practices are no small part of the problem. The scale on which most of the developed world farms seems to require that we oppose the natural character of a piece of land on a monumental scale with earth moving, irrigation and toxic chemicals galore, but this is a misapprehension: on the small scale, it’s still possible to farm in concert with the environment, learning from the plants, animals and soil about who lives here, how they live, and how, assisting and directing natural processes, we humans can deepen the health and fertility of this place while becoming part of it, and being fed by it. Healing water cycles is a necessary step, and a natural result, of acknowledging our most local, ecological citizenship, and it’s a responsibility no land owner can afford to neglect. We are really looking forward to this conference! Homesteaders of America states its goal: ‘to make homesteading normal again.’ This isn’t about business plans for growing mesclun on three quarters of an acre of imported mushroom compost and selling it in the nearest city for a city-grade income; this is about sustainability, about food, about home. We’re proud to be speaking with a great line-up, including Joel Salatin, Justin and Rebekah Rhodes, and Doug and Stacy (‘Off-Grid with — ‘). This event promises to focus on real skills and methods for meeting real needs like food, shelter, and beauty, without specialty gadgets or exotic ingredients. Call your friends in Front Royal and tell them you’ll be staying with them the weekend of October 12. Hope to see you there! The top of the new swings at the lower farm, where our guest house is, is fourteen feet up. It would have been fifteen, but the frame was too heavy to lift entire, so our carpenter (Bud) backed off the mortices and we raised the posts separately, then used our friend Tim’s tow truck to lift the lintel. The truck could only go up to fifteen feet, and of course the tenons added another ten inches or so, so the posts had to lose a foot so we could set the beam. No problem, the arc still sends you up into the neighboring tree tops. Make a reservation on airbnb and come try it yourselves! After we harvest what corn we want for the house — mostly for fresh eating, some for freezing or canning — the rest of the corn is food for hogs. We can’t let it dry for long storage — the deer, raccoons, and especially the birds will get it long before that — but we wait as long as we can to let the ears mature, and then when we see signs that the birds think it’s ready we go out with machetes and cut it, stalk and all. Hauled home and stacked in the barn, it goes a long way toward the hogs grocery list for most of the fall. And since it’s stacked in the barn, the chickens get their share, too.